Swede Seed delivered direct by D.T.Brown seeds. What's in a name? 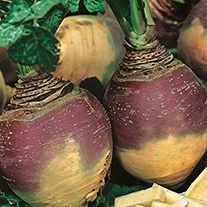 The swede is originally an abbreviation of Swedish turnip, where the vegetable is thought to have originated, and this is how they’re known in most of the south of England. However, in many areas of Northern England, the Midlands, the South West and Ireland, they're called turnips; in Scotland, they're the neeps of Burns Night. You'll find them called rutabaga in the US and Canada, from a Swedish dialect meaning 'stumpy root'. 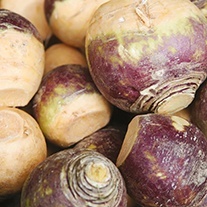 Here, we’re looking at the larger yellow or creamy-fleshed type with skins turning purple towards the tops, not the smaller, smoother, often brightly coloured turnip. Swedes grow well in cool, moist climates and heavy soils. 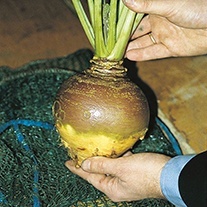 They need constant moisture, so avoid growing swedes in dry or sandy soils, as the skin can crack, growth becomes tough and corky and a bitter taste develops. Swedes are in the ground for a long time, like most winter crops, so bear this in mind when planning your vegetable garden or allotment. The key to success for seedlings is a firm seedbed, so tamp it down before sowing. 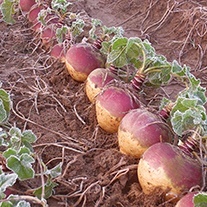 Sow swede seeds outdoors from early May in the north to mid June in the south. Sow 2cm (¾in) deep in rows 38cm (15in) apart. Thin to 23cm (9in) apart. Swede seeds can be also be sown in modules filled with multipurpose compost and planted out when the roots grow through the drainage holes if the weather is particularly bad. They need an open, sunny, weed-free site that has been dressed with well-rotted manure (such as Orgro) or garden compost plus a general fertiliser containing trace elements. Harvest mature roots from September to November, or leave them in the ground until Christmas. Protect the crowns with straw or bracken before cold weather, or lift and store swedes in potting compost in a cool shed or garage. Despite their old reputation as a poor man's vegetable, swedes are versatile and delicious. Both the leaves (tops) and the root can be eaten. The leaves can be used as a general all-purpose green vegetable when not much else is around. Try the roots in soups, cubed and roasted with rosemary alongside other root veg, or mashed with pepper, freshly ground nutmeg and cream for a luxurious accompaniment to a Sunday roast.